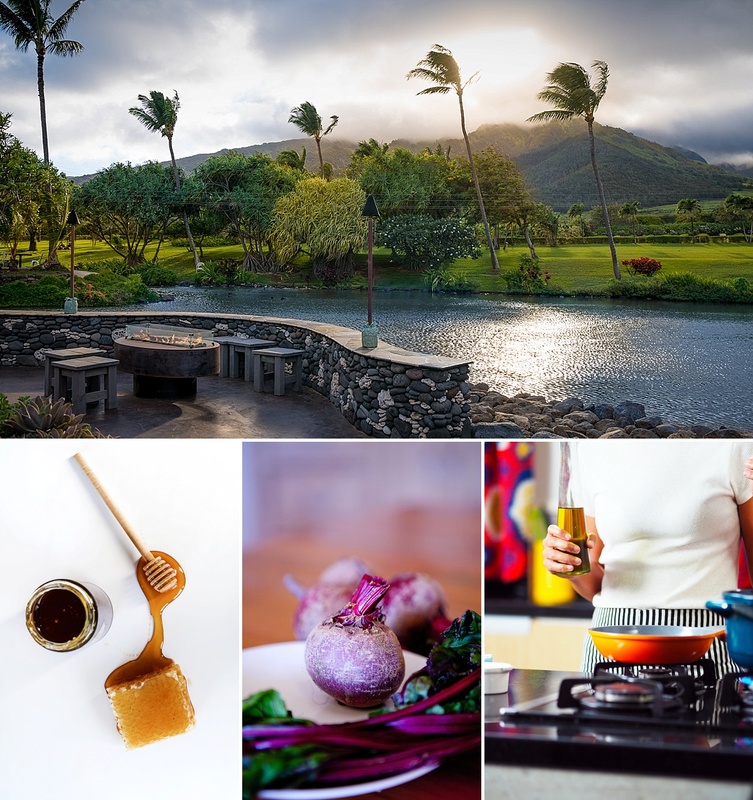 As a new addition to our monthly blog posts, we’ve decided to reach out to our world class Maui craft community for some recipe inspiration you can try at home. 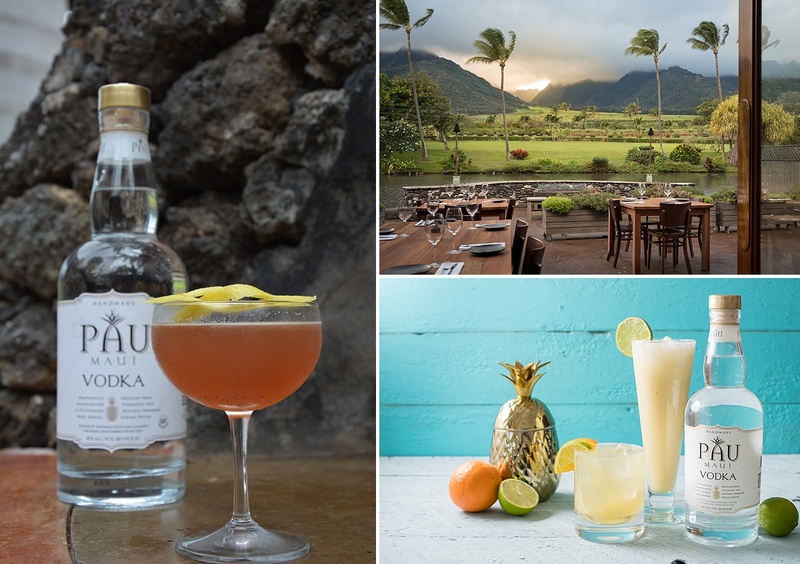 From its prime location in the stunning grounds of Maui Tropical Plantation to award-winning Chef Jeff Scheer and talented team of craft cocktail artisans, The Mill House has graciously provided us with some farm-to-table food and beverage recipes to try out this fall! Whip up these Roasted Beets and Squash Pizza alongside a handcrafted Shrub Royale Cocktail for your next dinner party, brunch potluck, or even casual dinner at home with family or friends, and let us know how it goes by tagging us in your photos at @MauiCraftTours and @MillHouseMaui on Instagram. Wash beets. Toss with extra virgin olive oil, and lightly season with salt and pepper. 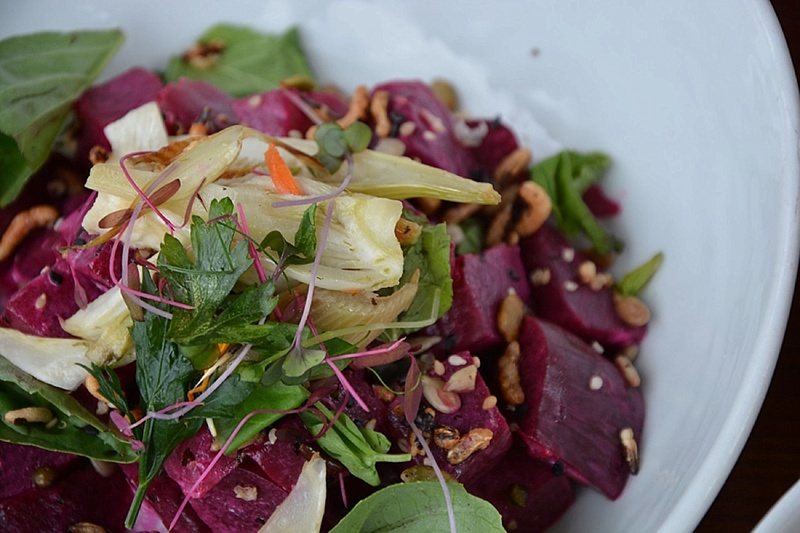 If roasting two different color beets it is important to keep them separate with the same steps involved. Place beets in a 4 inch hotel pan and add just enough water to cover the bottom. Add the bay leaves and thyme. Cover with foil, bake for one hour or until tender. Should be able to insert a cake tester with no resistance. Place beets in stainless bowl and quickly wrap with plastic wrap to allow beets to continue to steam and loosen the skin. Allow to steam for 10-minutes only or they begin to cool and the skins will adhere to the beet. Using a damp towel, brush along the outside of the beets and place in a container deep enough to hold the beets and the marinade. Do not rinse beet or you will be washing flavor away. Place beets in vacuum seal bags. Whisk beet marinade together to temporarily emulsify dressing. Pour enough marinade over the beets to cover. Vacuum seal. Refrigerate for at least 24 hours. Mix in bowl till smooth. Combine sunflower seeds, white sesame seeds and black sesame seeds. Toast on parchment lined 1/2 tray at 350 degrees until golden brown, about 10-12 minutes. Heat a pot of oil to 400 degrees. Line 2 sheet pans with chic towels and set aside. In batches, fry the lentils until crisp, remove and place on a sheet pan lined with chic towels. Lightly season with fine salt. Fry wild rice until it puffs and immediately place on the other chic towel lined sheet pan and season with fine salt. Combine all ingredients in a mixing bowl. Taste and adjust seasoning if needed. Place water and salt in a mixing bowl fitted with the paddle attachment. Mix on speed 1 until the salt is completely dissolved. Mix flour, yeast, and malt powder together. While the mixer is spinning on speed 1, slowly add the dry ingredients in very small amounts. Once the dough starts to tighten up remove the paddle and replace it with the dough hook. Continue adding the dry ingredients in increments until complete. Once the dough has formed continue mixing on speed 1 for an additional 10 minutes until the dough is uniform and completely smooth. Allow the dough to rest in a well oiled container until doubled in volume. Portion in 200g increments and roll into a tight ball. Refrigerate overnight. 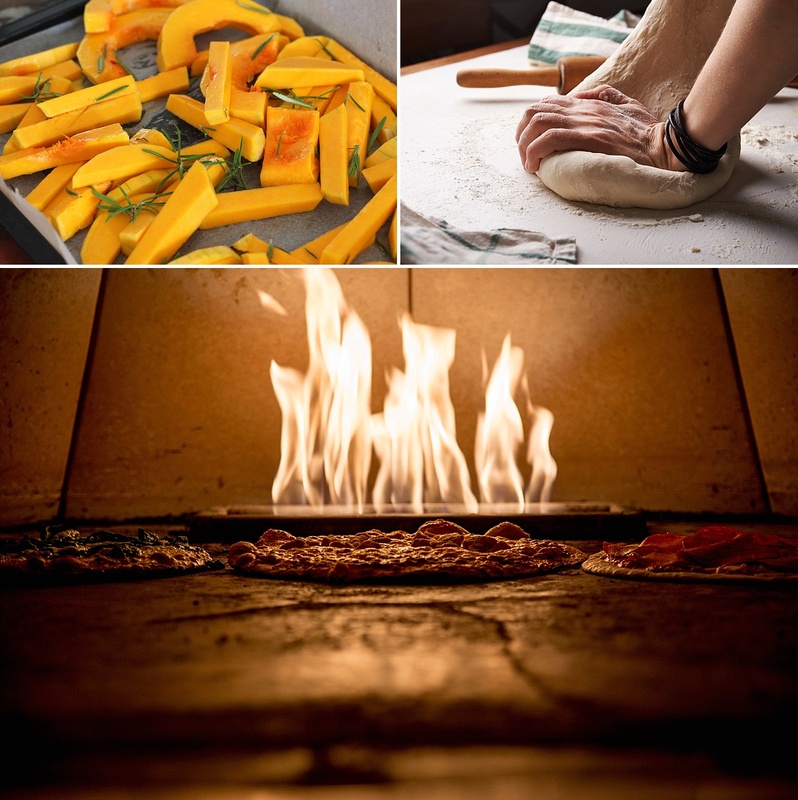 Set squash in wood-fired oven on low heat overnight. Half squash and dress with olive oil, salt and pepper. You can add any additional toppings to your squash pizza! 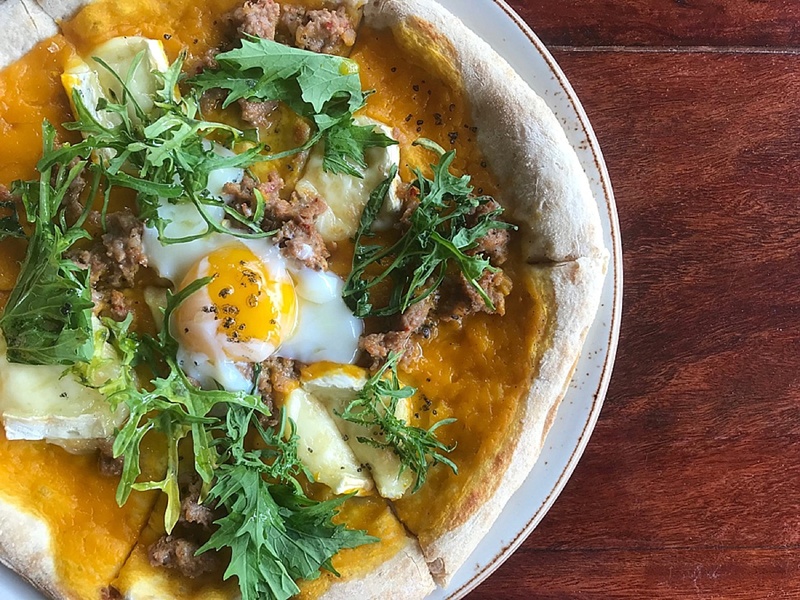 At The Mill House, the Squash Pizza is topped with Italian sausage, egg and truffle brie. Macerate organic sugar and fruit together in equal volumes. Can be strawberry, pineapple, guava, lychee – any of your favorite combination works! Let the mixture sit covered at room temperature for 12-24 hours. Add another equal volume of your favorite household vinegar. You can adjust the amounts of sugar and vinegar to taste. PAU Maui Vodka, St. Germain Elderflower, Crème de Cassis, Pineapple-Vanilla Shrub, Lemon. Huge mahalos to The Mill House for providing these absolutely amazing craft craft food and cocktail recipes, and we can’t wait to try them out for ourselves! Or, you know… skip the prep work and order them after one of our Maui Craft Tours. Either way, it’s a win win.